The Short Range Certificate is the minimum qualification required by law to control the operation of VHF and DSC equipment on any British flagged vessel voluntarily fitted with a radio. This includes both fixed and handheld sets. 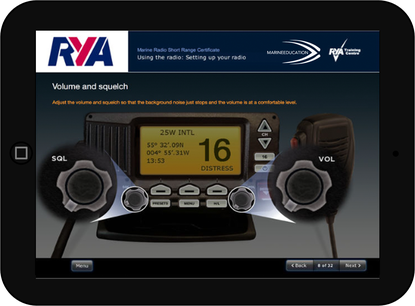 Find out more about the Marine Radio (SRC) course on the RYA website. You are strongly advised to 'try the taster before you buy the course' to ensure that the device you intend to complete the course on is compatible. No refunds can be issued for incompatible devices. This course can be taken as an online course (or as a classroom course), however one of our RYA instructor's is on hand to provide as much support as you require, this is done predominately by email, but we can also offer Skype chats at pre-arranged times. A good option to save shipping costs if you live outside of the UK! To enable access to your online course we need to share some of your personal data with the RYA via your user profile in www.ryainteractive.org This learning management website is hosted and maintained by a third party called Learning Pool, who will not use your personal information for any reason other than enabling your course. Your name and email address will be entered on www.ryainteractive.org in order to create your user account. On your first access to the site, you will be asked to enter your address and date of birth. You will have access to the site for one year in order to complete your online course. During this period, your personal information will be held on the website by Learning Pool and be available to this training centre and the RYA for the purpose of managing your course. Instructional support will be provided by this training centre for a period of 3 months from the date of your course booking. How does it all work? Once you've recieved your login information email from us, click HERE and login with the username & password we send you. We will mail your course pack, but you don't need to wait for this to start your course. Carry out the online course at a pace to suit you. If you have any questions at any stage about the course content, simply email your instructor. Whats involved in the exam? Netbooks are NOT supported due to the reduced screen resolution. Please visit the Help page on the RYA Interactive website. iPad running iOS 11 minimum using Safari. PC running Windows 10 minimum with the latest version of Microsoft Edge, Google Chrome or Firefox. Android tablet running 4.1 minimum using Google Chrome.